My pre-teen years were spent in New York state, about an hour outside NYC. Like most middle Americans, my family’s default distraction was the local mall. 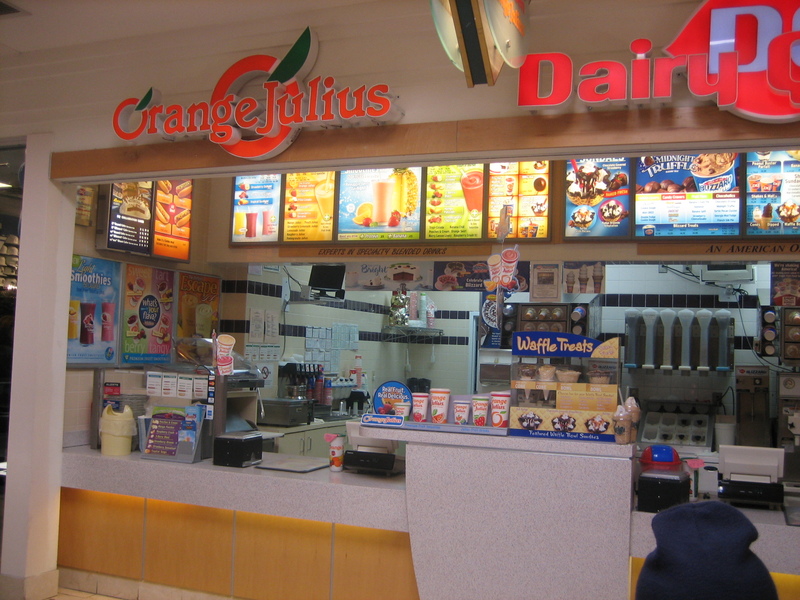 And that meant one thing: with 99.9% certainty, we’d be stopping at Orange Julius. 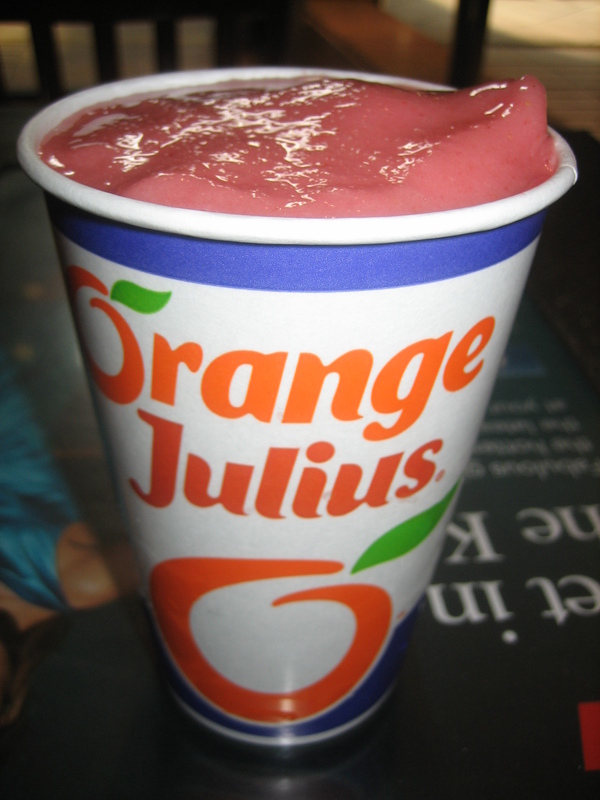 For those of you who haven’t had the pleasure, an Orange Julius was originally fruit juice, ice cubes, milk, sugar, and flavoring, frothed up in a blender. These days they offer premium smoothies, “boosts,” and other variations on the theme. As a kid, the great thing about Orange Julius was that I could get my sugar on in the guise of a vaguely healthy concoction. I seriously doubt my parents had any inkling how much sugar was lurking in those drinks. Of course, this was back before sugar, salt, and carbs were officially evil. The chain has since been purchased by Dairy Queen, so consider it the KFC-Taco Bell of frozen treats. For kicks, I tried the Strawberry Julius recently at Montgomery Mall, which tasted as I remembered it. But it’s now too much for my adult taste buds–which screamed in protest, “too sweet!” Curiously, the strawberry flavor isn’t listed on their nutritional chart. The omission makes me assume the worst: that the sugar content is even higher than that of the Strawberry Lemonade Julius, at 51 grams per 16 ounces. Pure speculation, but I shudder to think. Meanwhile, the raspberry-almond left us high and dry–maybe because the filling/pastry balance was off, it was simply a bore. I’ve had Entenmann’s pastries that were more exciting. 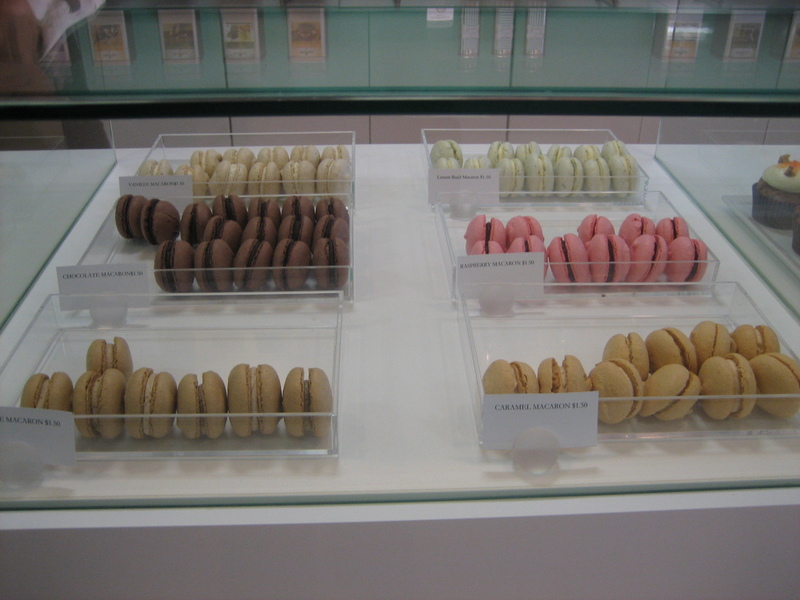 So, in summary: go to Praline Bakery. Go early or risk disappointment. Get the bear claw, chocolate-pistachio, and pear-caramel pastries. Wash them down with a mug of bitter coffee or tea, and enjoy the sugar/butter/chocolate high. And marvel at the fact that some French people start every day like this. Frosting is a bakery opened by a couple of newlyweds who gave up their 9-5 office jobs to follow their dreams (sound familiar?). The bakery sits on the edge of the Giant, a 5-minute walk from Friendship Heights Metro. The couple who runs the place was recently interviewed on the local news, so I expected the shop to be buzzing. Not so. There was only one person ahead of me, and the early-morning weekday offerings were a bit scant (they don’t bring out the full regalia of cupcakes until 10:30). The dollop of frosting reminds me of Tintin's quiff. I didn’t plan on getting the Frenchie cupcake, but the lady working the counter said it was one of her favorites. The cake base is definitely French toast-inspired. Seems the latest trend is cupcakes that are trying to be other things, like this pie-inspired cheddar-apple cupcake. Anyway, the cake part of the Frenchie wasn’t sweet–it tasted a bit like cinnamon toast. This contrasts nicely with the maple buttercream icing (which I could’ve sworn was cream cheese, but either way, it was delicious). Turns out cupcakes posing as French toast is actually a good thing. Mr X-sXe and were strolling around downtown Bethesda when we spotted Yogiberry, a self-service yogurt place that’s decorated like a candy store on acid. 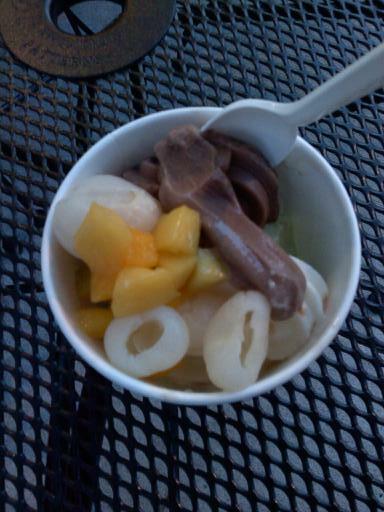 I’ve been skeptical about self-serve froyo ever since being underwhelmed by FroZenYo, but we decided to give it a go. I was taken aback/impressed/baffled by the Asian-ness of the offerings. With flavors like taro root and toppings like rambutan, litchi, and longan (very similar white-fleshed Asian fruits, below), you’d think you were in Singapore or something. 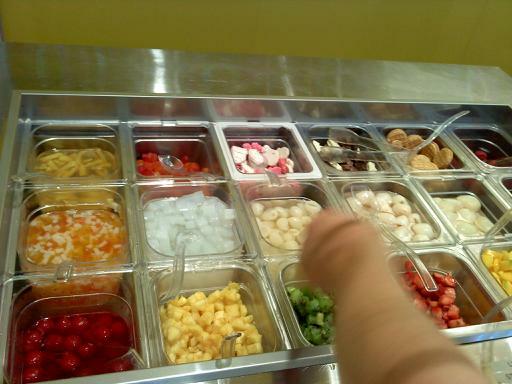 Collectively, we tried the chocolate, original, pistachio, taro root, coconut, and green tea yogurt flavors. 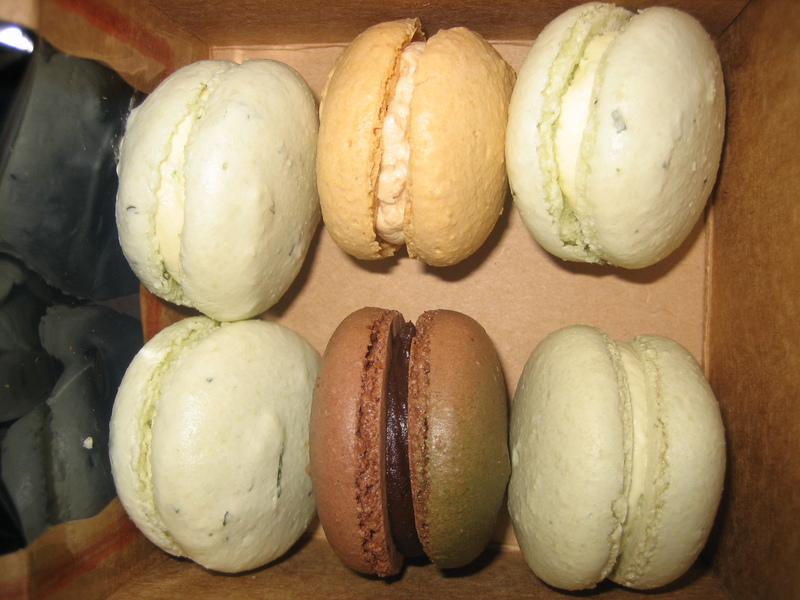 Our favorites were the original and green tea, which are worth going back for. Least favorite? 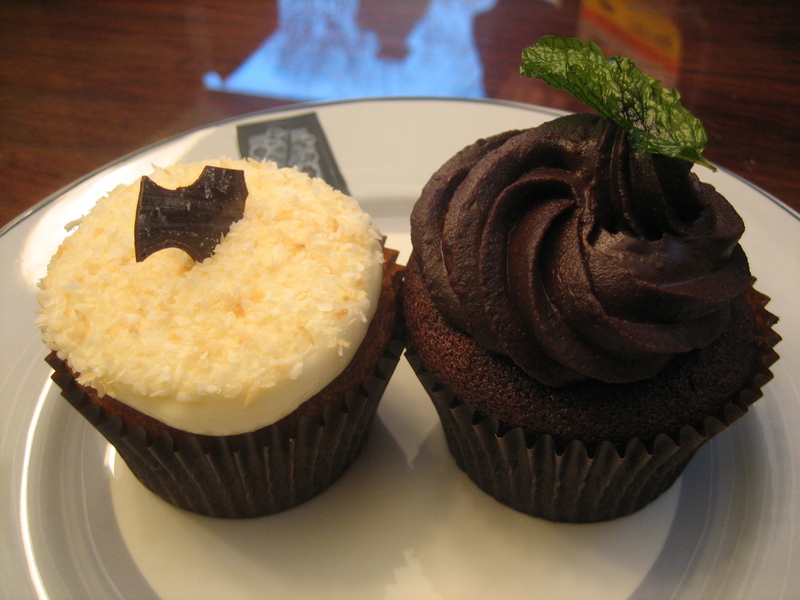 The chocolate (too icy) and coconut (too sweet). Problem is the temptation to go overboard at these places. At 49 cents an ounce, our yogurts came out to $6+ apiece (!) And beware if you’re caught tasting or eating before you’ve paid: there’s a $10 on-the-spot fine, though we didn’t see any froyo police milling around.